The “Hearts of Children” charity gala dinner, held on 27th August in Zurich, was a resounding success. 60 illustrious guests responded to the invitation of Messrs Türler, Directors of Türler Uhren & Juwelen and Peter and Aletta Stas, Founders and Directors of the watch brand Frédérique Constant. They all turned out to support the Swiss Heart Foundation and the “Hearts of Children” initiative. The World Heart Federation is dedicated to working with national heart foundations – such as the Swiss Heart Foundation in Switzerland – in the fight against heart disease and strokes as the leading causes of death worldwide. Swiss watch brand Frédérique Constant has been working since 2009 alongside charitable organizations involved in the fight against heart disease. The brand is currently supporting the World Heart Federation’s “Hearts of Children” international awareness-raising campaign. The focus of these activities is on preventing disease in women and children. The aim is to increase awareness of the importance of cardiovascular diseases and of the risk factors, so that fewer people are affected by or die from preventable cardiovascular diseases. In order to support the project locally, Frédérique Constant organized a charity gala dinner in aid of the Swiss Heart Foundation and the “Hearts of Children” initiative in conjunction with renowned Zurich watchmaking specialists Türler Uhren & Juwelen at the Savoy Hotel Baur en Ville in Zurich. Franz Türler, owner of Türler Uhren & Juwelen, reminded his guests that the premature loss of loved ones due to cardiovascular disease is something that can strike any one of us. It was thus vital that he support Peter and Aletta Stas from Frédérique Constant in their commitment to the World Heart Federation and the Swiss Heart Foundation's international “Hearts of Children” initiative. 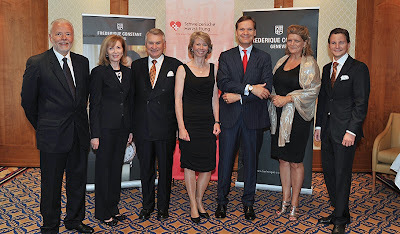 The World Heart Federation was represented by CEO Johanna Ralston and the Swiss Heart Foundation by its President, Prof. Ludwig von Segesser, Director of Cardiovascular Research at Lausanne University Hospital (CHUV), together with their Managing Director, Therese Junker. In his evening lecture, Prof. von Segesser impressed upon his audience the often tragic fates of children with cardiac problems, but also pointed to what research has already achieved in this area and the promising developments that lie ahead. Thanks to the generosity of Türler Uhren & Juwelen and Frédérique Constant, together with the proceeds of the raffle, the Swiss Heart Foundation received a check for CHF 22,890. The generous sums donated by guests will be added to this total. Half of the total will go towards research funding in the field of congenital heart disease and awareness-raising and education of women as part of the Women & Heart activities of the Swiss Heart Foundation. Standing shoulder to shoulder, Frédérique Constant, Türler Uhren & Juwele, the Swiss Heart Foundation and the World Heart Federation aim to give more hope and shared time to the families affected.